It’s harvest time, and I just love it! There have been so many phone calls from friends and family wondering if I would like some treasure or another from the garden. Last weekend my good friend, Annabelle offered me fresh herbs from her garden: rosemary, bay leaves, thyme (various kinds), sage, lavender and oregano: what a windfall! I piled my car with arm- loads full of fragrant herbs and the next day found me busily sun drying many of them in the gorgeous late summer sun. However, I reserved bunches of fresh herbs for this very special red lentil soup. Having made it before, I knew that the fresh herbs turn this soup into an intoxicating concoction. Honestly, I always have to go back for seconds! So, if you find yourself with a bounty of herbs in your garden, I suggest that you give this recipe a whirl. I just know you won’t be disappointed. I found it in one of my favourite local Canadian cookbooks, “Rebar Modern Food Cookbook“, by Audrey Alsterberg and Wanda Urbanowicz. I will be bringing a huge tureen of this delight over to Angie’s Fiesta Friday tonight. I just bet that many of the gang have bunches of herbs waiting for an awesome recipe like this one. If you haven’t checked out Angie’s virtual blog party yet, you don’t know what you are missing! We love new comers, so please come and join us! Fresh herbs are the game-changer in this soup! Rinse lentils thoroughly in a colander under cold running water until the water runs clear. Set aside to drain. Heat oil in a soup pot over medium heat and sauté onions with 1 teaspoon salt until translucent. Add garlic, carrot, pepper, chiles, herbs, bay leaves and remaining salt. Stir well and sauté until the carrots are just tender. Add the lentils and stock and bring to a boil. Reduce heat to a simmer and cook, partially covered, until the lentils are soft and falling apart. If you like, the soup can be puréed or left as it is. If you choose to purée, remove the bay leaves first. Season the soup with lemon zest, lemon juice and more salt and pepper to taste. Before serving, stir together the feta cheese, rosemary and pepper. Sprinkle over the hot bowls of soup and sigh with delight! Cries of “More Please!” will be emanating from your kitchen! This soup looks so amazing, Julianna! You’re so lucky to have a garden full of herbs ready to be harvested! I’ve actually never had lentils before but I’m thinking about trying it now! Thanks so much, Linda! It really is one of my very favourite soups! Oh wow Julianna – I had to come over and see what this was about – it sounds wonderful! Lucky you to have friends giving you their harvests – enjoy!! Happy Fiesta Friday to you! This is just my kinda bowl there chef! I love my red lentils and add those as base in various soups like zucchini and tomato for added richness. I am so making these. Rosemary is my favorite fall herb along with thyme. Made some pan grilled potatoes with rosemary and garlic yesterday for the kids to snack on. That Herb just bursts with the best :$. Mmm! I love my rosemary too! I had a bunch drying in the sun the other day and I was sitting beside the pan reading a book! Wow, the fragrance was just incredible. I could have sat there all day! I agree…the lemony rustic smell of rosemary. My oldest loves thyme rosemary and lemon chicken too. Lentils are on of our favorites! Love the ingredients in this soup! Oh, Julianna…this soup would be perfect to cure the September chills. 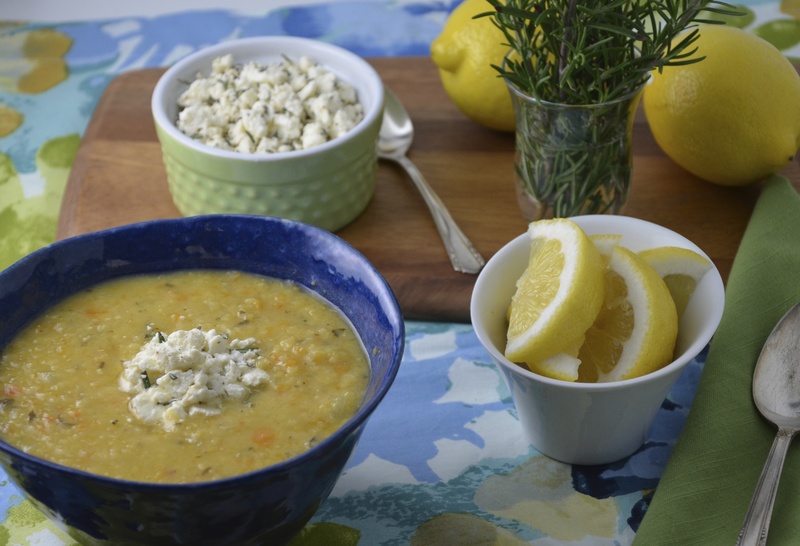 Delicious flavors…love the red lentils! 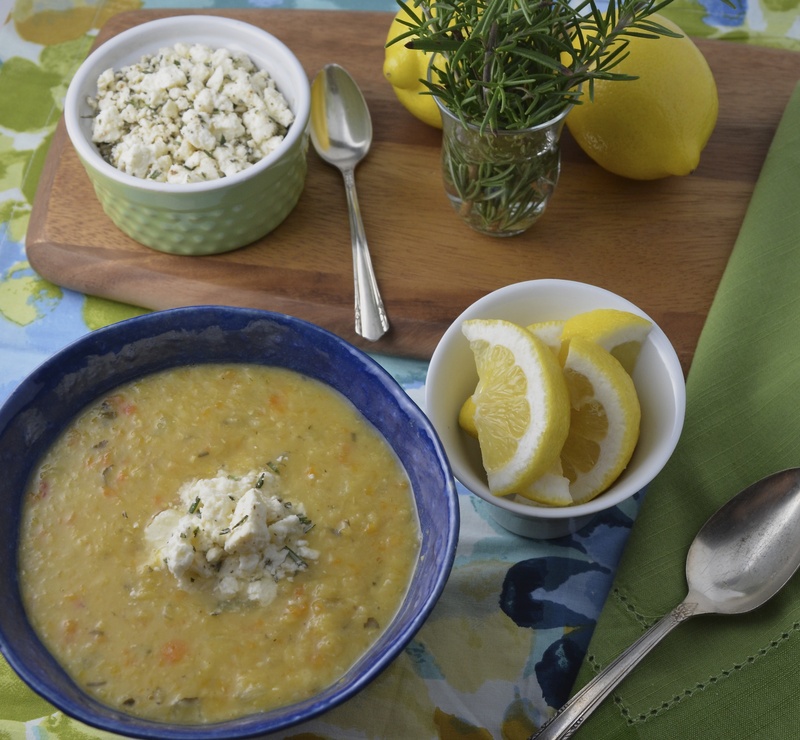 I have never make lentil soup, but will definitely thy this! I WILL make this Julianna, sounds like my kind of soup (but aren’t they all!!!) 😉 What a big bowl of yummy this is, thanks for sharing. I wonder if I could make this in the crockpot?? I’m very lazy and like to use my crockpot where possible haha! It sounds super yummy though, I love lentils and all those fresh herbs with the feta sounds divine. I would have to go out and buy fresh herbs though as I have the opposite of green fingers, can’t even keep basil alive! Thanks for the reminder to use all our fresh herbs while we have them and offer such a delicious way to use them. We had our first light frost last night and have already lost our basil (except the pot I have in the greenhouse) but the others are still OK.
OH no, frost already? Quick then, if you have some fresh rosemary, you need to try this, Hilda! You’re very welcome, Loretta! Hope you enjoy it when you get to make it! I have the Rebar cookbook and absolutely love it! Your photos have made this recipe look truly inspiring! Yum! That looks delicious and warming! Delicious, you have turned ordinary lentils into a exciting and delicious meal. YUM! Hey Suzanne! So glad you think so! It really is yummy! I love red lentils- SO GOOD! This sounds wonderful- I’ll try it for sure – Thanks!! Happy FF! Aww, thanks! Happy FF to you too! Well… SEVEN MILLION YEARS later… and after making this delicious soup TWICE, I just posted it with a link to your post. Thanks for the wonderful recipe!! That looks incredibly hearty and delicious! I’ll just leave out the Feta cheese for a vegan version. This sounds so wonderful! And I love that it is full of fresh ingredients! Definitely saving your recipe Julianna, because I want to try it! 🙂 Happy FF! Appreciate you! Lentils are so good in soup! I really like the smooth texture and it makes for such a filling, warming meal. Happy FF. 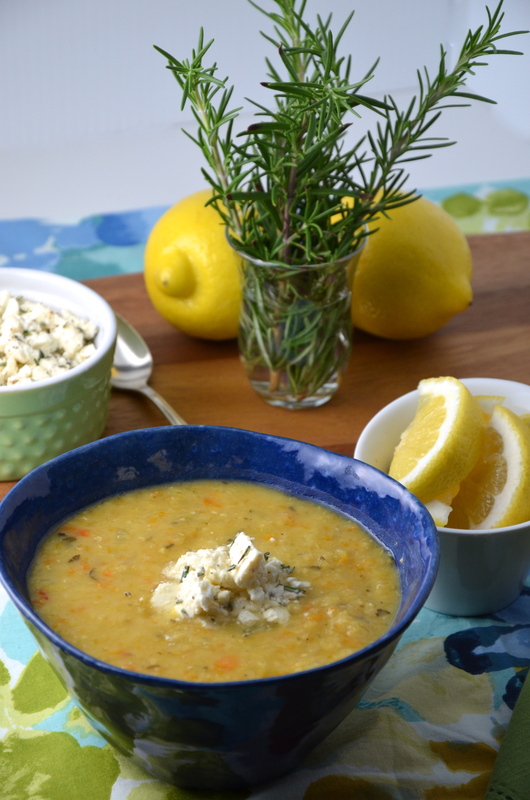 Lentils and feta are one my favorite combos! Yum Yum Yum! Oh wow, Julianna, a big bowlful of this goodness to warm me up please!! Great that you have access to such wonderful herbs, I should start a herb garden next year, even if it is just to make this awesome soup! Yum! Oh wow, Naina! You really should start an herb garden! You will blow your family away with all of the flavour coming from it! Your right, this soup spells summer alright. Haven’t tried it either so will have to fix that up quick smart. Oh this sounds so wonderful. Perfect fall recipe. Wow, how cool is that! Sure hope it turned out well! Wonderful with some gorgeous artisan bread! Sounds fantastic. I’ve been looking for a new red lentil soup recipe lately (getting bored with dal) and I’m definitely going to try this one.